This video was recorded in July 2010 as part of the inaugural Summer Colloquium for incoming NYU Abu Dhabi students. The theme of the colloquium was “Cosmopolitan Ideas for Global Citizens.” One of the goals of the colloquium was to get students thinking about a term — cosmopolitan — is often applied to both New York and Abu Dhabi and as a result to NYU Abu Dhabi. To its credit, NYU Abu Dhabi as an institution has embraced the idea of cosmopolitanism with a self-conscious deliberateness that led to a series of ongoing programs and conversations about the benefits and the costs of embracing cosmopolitan ideals. The opening of NYUAD’s New York home at 19 Washington Square North last year was marked by the inaugural session in a series on “The Cosmopolitan Idea” that continued throughout the 2009-10 academic year. Subsequent sessions focused on such topics as “Cosmopolitanism and Multiculturalism,” “The Cosmopolitan Idea and National Sovereignty,” and “The Universal Claims of Cosmopolitanism.” (Many of these talks given at theses sessions will be collected in a volume due out this spring.) An exhibition of photographs by Zubin Shroff entitled “The Cosmopolitans” opened in New York before traveling to Abu Dhabi this fall. A few weeks before the opening of 19 Washington Square North, I had the privilege of giving a lecture at the invitation of the NYU Abu Dhabi Institute during my first visit to Abu Dhabi. The subject of the lecture was “Cosmopolitanism, Multiculturalism, and the Promise of Literature.” The sample classes that I taught during three admissions weekends in Abu Dhabi also exposed candidates for admission to NYUAD to current thinking about cosmopolitanism. In all of these venues, I tried to explain how cosmopolitanism has evolved from being a critique of nationalism into a critique of universalism, in which difference is conceived not as a problem to be solved, but rather as an opportunity to be embraced. As a student attending NYU Abu Dhabi, you have been described as cosmopolitan. But what does it mean to be a cosmopolitan in an international context? Often the term is associated with the sophisticated urban elite; however, the root of the word, “cosmos,” refers to the universe. A cosmopolitan is therefore a citizen of the world, with no national or political home. But how can one become a citizen of the world? Is it even desirable to do so? After all, few people want to divorce themselves wholly from a cultural community in order to join a global society. While human beings may share some beliefs, desires, and values, we rarely agree wholeheartedly on our interpretations of those beliefs, desires, and values, which are often rooted in experiences grouped by geographic place. The summer colloquium offers an opportunity to discuss the advantages and limitations, in short the paradox, of being a cosmopolitan. 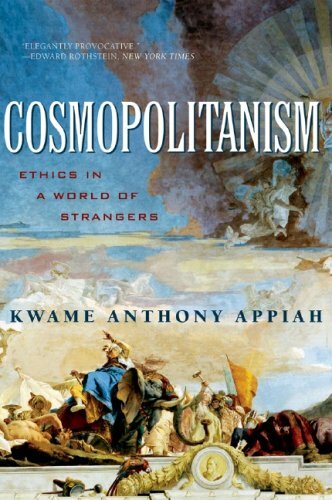 In early July, my NYUAD philosophy colleague Matthew Silverstein began convening online chat groups that put the students in conversation with one another across geographical and temporal divides, helping them to distill their thoughts on Appiah’s book into a set of questions about cosmopolitanism. The students were interested in the history of philosophy that Appiah presented to them in his account of “positivism”; in the relative claims of the individual and the communal in cosmopolitan theory; in the rhetorical strategies that Appiah employed; and in the ways that the rather abstract ideas presented in Appiah’s account could be put into practice. I recorded this video in response to those questions — not with the aim of offering definitive answers, but rather with the aim of continuing the conversation, venturing provisional responses, and seeking out even more challenging questions. When I was growing up, strangers would ask me, “Where are you from?” and I’d say, “New York” or “the upper West Side.” They’d look vaguely disappointed: “No, I meant what’s your background.” I wasn’t really being disingenuous, though I was well aware what the first question really meant. It’s just that I never particularly identified with either of my parents’ cultural traditions. My father is a Parsee, born in Karachi, when Karachi was a part of India, and my late mother was a Filipino. They had met at the International House at Columbia University, my father coming from Pakistan to study mathematical statistics, my mother from the Philippines to study literature and drama. We spoke English at home, and my parents had gradually lost their fluency in their mother tongues (Gujarati and Tagalog, respectively). What I identified with was being mixed and being able to slip from one cultural context to another. To my Parsee relatives, I looked Filipino; to my Filipino relatives, I looked “bumbai”; and to my classmates—well, on the rare occasions when someone wanted to launch a racial slur, the result was usually a lame attempt to insult me as if I were Puerto Rican. We weren’t particularly religious at home, though we did celebrate Christmas and made it a point to attend the Christmas Eve services at Riverside Church in New York, a few blocks up the street from where we lived. My mother sometimes liked to attend Easter services there as well. It was always assumed that I would become a Zoroastrian like my father. As my mother explained it, that way I could keep my options open. I could convert to Christianity but not to Zoroastrianism later, because Zoroastrianism didn’t accept converts. But, when the time came during third grade for my navjote ceremony to be performed, we couldn’t find a priest. We kept hearing excuses along the lines of, “I would do it, but my mother-in-law is very old-fashioned.” The problem was that my mother was a Christian—oddly enough a Protestant, unlike most Filipinos, because my grandmother had converted to a Pentecostal sect before my mother’s birth. Eventually, we managed to secure the services of a priest from Mumbai who was traveling in the U.S. and spending some time in New York. Four years later, we had to go to London to have my sister’s ceremony done. I later realized, I told my audiences, that this experience to be an early lesson in the dynamics of culture, though it would take me years to recognize it: my parents’ marriage was an emblem of cosmopolitan cultural mixing, while the priests’ belief in the importance of cultural purity served as an emblem of all the forces that are arrayed against cosmopolitanism. Like Appiah in Cosmopolitanism, I’ve adopted the tactic of using stories from my personal history — and the history of my family — as a way of getting across some of the complexities of cosmopolitan theory. I chose to begin the summer colloquium video, therefore, with another bit of personal narrative, this time about the origins of my name — Cyrus Rusi Kaikhusroo Patell — and the naming of my children. Conversation across boundaries of difference and cultural divides is the practice that lies at the heart of cosmopolitan theory. This video is meant to serve as an invitation to conversation, a conversation that we are committed to continuing here at Electra Street. Cyrus R. K. Patell is Associate Dean of Humanities for NYU Abu Dhabi. Electra Street’s “Colloquium on Cosmopolitanism” will continue throughout the coming year. Videos from “The Cosmopolitan Idea” series held at the NYU Abu Dhabi Institute in New York can be found at http://nyuad.nyu.edu/news.events/video.nyc.09-10.html. The lecture “Cosmopolitanism, Multiculturalism, and the Promise of Literature” is available at http://nyuad.nyu.edu/news.events/video.ad.09-10.html.